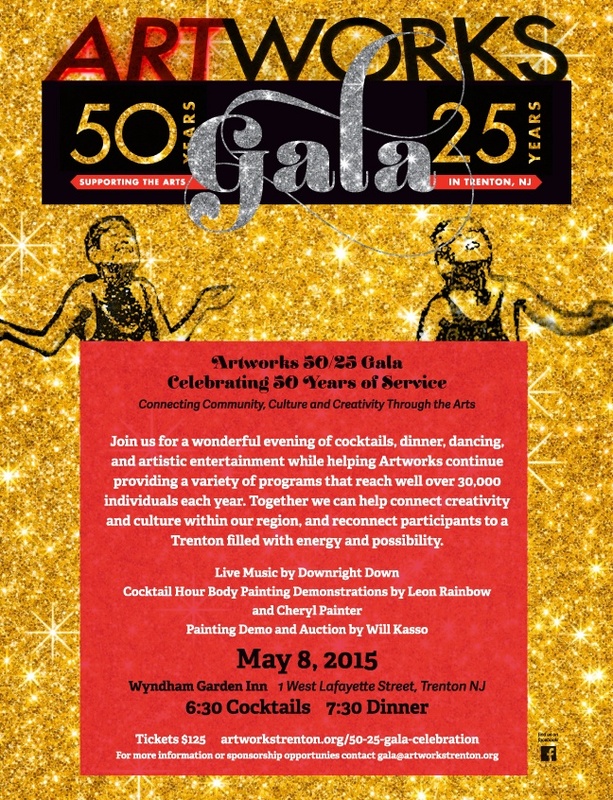 Artworks has been a part of the cultural landscape in Trenton and throughout Mercer County for 50 years, providing programming including Art Exhibitions, Adult Education, Youth Education and events such as “Art All Night” and “Art All Day”. These programs have provided a community building bridge between the city and its surrounding suburbs, offering creative outlets for residents as well as attracting people into the city for diverse and uniformly positive arts events. Please join us for a wonderful evening of cocktails, dinner, dancing and artistic entertainment while helping Artworks continue providing a variety of programs that reach well over 30,000 individuals each year. Together we can help connect creativity and culture within our region, and reconnect participants to a Trenton filled with energy and possibility. *We have determined that the estimated far market value of the dinner and entertainment for each ticket is $50. The balance of the ticket price is a deductible charitable contribution for purposes of federal income tax law. can’t wait! Should be a great time.